10h00-10h45 Keynote Speech: “Challenges of the ICC Office of the Prosecutor in Conducting Preliminary Examinations and Investigations”. 11h15-13h15 Panel on “Issues concerning the Exercise of Jurisdiction by the International Criminal Court over the Crime of Aggression: The Interaction between Law and International Relations”. 15h00-16h00 Group Discussion on Panel 1 by Geographical Region. 16h00-18h00 Panel on “The Impact of the Universal Declaration of Human Rights in its 70th Anniversary: Achievements and Failures”. 18h30-19h30 Group Discussion on Panel 2 by Geographical Region. Group discussions will take place in different rooms. Each speaker will set out the main views held in the geographical area from which he/she comes from. Participants in the event can choose which debate they would like to be involved. They would be entitled to change rooms only once, so as to participate in a maximum of two debates. The I Polyphonic Day will deal with issues concerning international law (private, public and criminal) with speakers from different geographic areas (Africa, Arab countries, China, Ibero-America, Iran and Russia). It aims at bringing together and debating the views and perspectives of academics and professionals coming from the said geographic regions. The I Polyphonic Day on International Justice is organised by the Ibero-American Institute of The Hague as part of the VII Ibero-American Week of International Justice, in partnership with a number of partners including the The Hague University of Applied Sciences, The Foreign Ministry of The Netherlands, the African Foundation for International Law, the Chinese Initiative on International Law (CIIL), the Center for International and Comparative Criminal Law of Lomonosov Moscow State University and the Iranian Center for International Criminal Law. The event will be hosted at the Aula of the Hague University of Applied Sciences, located at Johanna Westerdijkplein 75 (just behind Holland Spoors Train Station), 2521 EN The Hague, on Wednesday 7th June 2017 from 10h30 to 19h30, and will be followed by The Hague Talks in The Humanity House located at Prinsengracht 8, The Hague from 20h00-21h30. The African Association of International Law (AAIL) is pleased to announce its 2015 annual conference entitled: International Economic Law and Development in Africa: Challenges and Opportunities. What legal frameworks are needed to ensure a conducive environment for sustained economic growth? How has international economic law (IEL) shaped the development agenda? Can justice, the rule of law and good governance play a role in inclusive economic growth? How effective have international and regional economic institutions been in promoting all aspects of development? What is the current state of investment arbitration and investment security in Africa? Are there correlations between economic growth and sustainable development of natural resources in Africa? 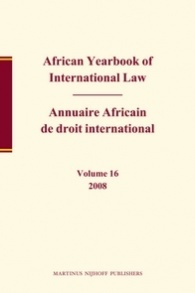 New research, methodologies or innovations in the teaching of International Economic Law in African Universities.